No other brand is represented in offroad sports with a history of success that can even compare to that of KTM. The special edition Six Days models celebrate this success with special performance upgrades and top-of-the-line components. 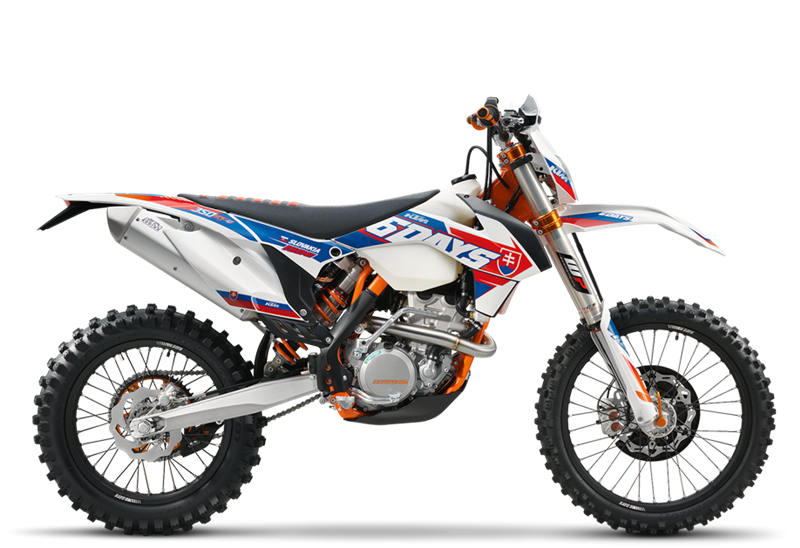 In 2015 the ISDE (International Six Days of Enduro) will be held in Slovakia, and the KTM model line-up has been suitably equipped to handle anything the muddy and rocky terrain can throw at it. VALVE TRAIN The crankshaft drives an intermediate multifunctional shaft, which in turn drives the coolant pump and the two camshafts via the cam chain, while also acting as a counter balancer. A hydraulic chain tensioner ensures reliable chain tension to achieve highly precise valve timings. ENGINE The 350cc 4-stroke engine with a state-of-the-art electronic fuel injection system offers a very wide power band and is distinguished by a dynamic but easy to manage power delivery. At over 45hp of maximum power, the 350 XCF-W is strong enough to beat any 450 in it's class. STARTER The engine is equipped with a kick starter as well as an electric starter as standard. Well protected behind the cylinder, the electric starter is connected to the starter freewheel on the ignition rotor via the starter drive in the ignition cover. HANDLEBAR All XC-W models are fitted with the super strong, tapered Neken handlebars made of high tensile strength aluminum alloy. The proven standard KTM mount allows the handlebar to be fixed in four different positions. The open hand guards are serial equipment providing optimum protection of the rider's hands. INDIVIDUAL SUSPENSION SETTING Each XC-W model has its own individual suspension settings, optimally tuned to weight and engine. At the rear, a PDS shock absorber from WP Suspension works with a direct linkage to the upper side of the swingarm. The wide range of setting options for rebound damping and high- and low-speed compression damping are standard on KTM bikes. TELESCOPIC FORK The KTM Six Days models are equipped with a 48 mm 4CS closed-cartridge fork from WP Suspension. The 4-chamber technology (4CS) patented by WP not only provides a key benefit in terms of responsiveness and consistent damping characteristics, it is also lighter and oil services prove to be far simpler than on conventional closed-cartridge versions. Suspension settings can easily be adapted to the terrain and rider in a matter of a few clicks at the top of the fork: compression damping on the left-hand shaft, rebound damping on the right - another advantage of the 4CS technology. HIGH QUALITY WHEELS The high-quality alloy wheels from GIANT made of extremely durable 7050 aluminum, featuring exclusive Six Days lettering and CNC-machined hubs, are standard on all KTM Six Days Models. An additional Six Days standard feature - a Supersprox 2-piece rear sprocket with steel outer ring and aluminum star. TRIPLE CLAMP The high-end CNC machined triple clamps have been specifically designed for off-road use and ensures precise handling thanks to precision clamping of the fork legs. The rider receives precise feedback from the front wheel, even in the toughest terrain, thereby increasing riding safety and speed.